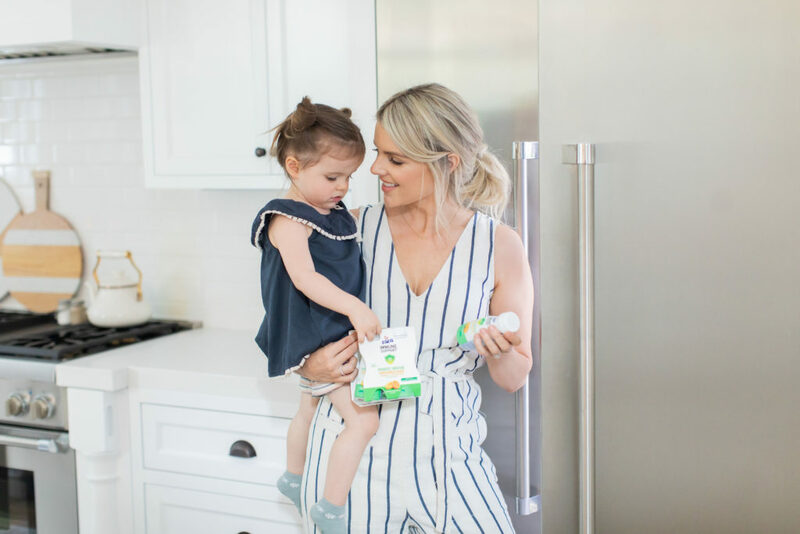 So excited about today’s blog post because I finally get to share a campaign I’ve been working on with you guys – The REAL Mom Revolution with LALA Yogurt Smoothies! I know you’ve seen me give Molly the smoothies in my Instagram story many mornings (I can’t even tell you how many DMs I’ve gotten from all of you asking for more information about the smoothies) and I’ve gotten so many questions from people asking where to get them. So I’m not only going to share info about them in today’s post but I’m also so excited to tell you guys that Molly and I are the faces of a campaign with LALA Yogurt Smoothies! Ahhhhhhhh! That’s right. In the next few months, if you are browsing the yogurt/smoothie aisle at Walmart, you might see our smiling faces on display! I honestly think I’ll cry when I go to Walmart for the first time and see Molly’s picture there. Such a proud moment as a mom! Kevin and Riley will be in some of the pics too, but this is really a mommy daughter thing! FYI – you should start seeing us in the campaign and on signage in Walmart starting in April! So keep your eyes peeled for signs like the one below! Go HERE to find out where else you can find them and try one today – they’re so good! First, let me tell you why I decided to do this campaign. When the offer first came to me to team up with LALA to be a part of their Real Mom Revolution, (I’ll get to more about what that is in a bit) I wanted to do my homework first. I actually hadn’t tried the product before because I never had seen it in my local grocery store. So through my research I found out that LALA Smoothies are SUCH a great snack for me and Kevin. But, I was REALLY excited that they have LALA Good Kids Smoothies, perfect to give my kiddos. They are made with real fruit, don’t have any high fructose corn syrup, and contain probiotics that are good for their little tummies. My pediatrician actually recommended we give Molly and Riley probiotics to help keep them more regular because they both tend to get backed up. And I’ve honestly noticed a difference since I started giving Molly a LALA Good Kids Smoothie most mornings. Yes, she gets one almost every morning and so loooves them! They also have new LALA Probiotics Smoothies for adults! They are also made with real fruit, have 10 g of protein (I sooo need the extra protein – it’s cause I mostly eat pasta! Ha!) and it are made with billions of probiotics. Plus, I love that they taste so good, fill me up and they’re just easy to grab when running out the door. Right now I am loving the Mixed Berry flavor, but really both flavors I’ve tried are great. It really depends on your personal preference! As you can see, through my research I found that this is definitely a product I can get behind! But I had to try it first! So I had them send me some to try and I was absolutely blown away! I love the adult smoothies. I feel like it’s a dessert even though it’s good for me. Plus, like I just mentioned, it’s so easy for me to grab one when I’m running out the door. Let’s face it, as parents were always thinking about ways to give our kids good and healthy food but we never think about ourselves enough. We don’t have time to! So drinking the LALA Probiotics Yogurt Smoothies makes it easier for me to eat/drink something good for me with absolutely zero prep time. Or thought really. Ha! My mom brain is fried these days and I can’t put much thought into what I’m eating during the day. Dinner is about all my brain can prepare for! And even though I love them, it doesn’t compare to how much Molly loves them! She thinks she has hit the absolute JACKPOT that she gets to have a smoothie in the morning. She thinks it’s Strawberry ice cream! (The Strawberry Blast flavor is her current fave) What’s a better scenario than that? A snack that is really good for your child that they think is an absolute treat?! Total mom win on my part! So as you can see I was totally game to get on board with LALA Yogurt Smoothies and be a part of the Real Mom Revolution campaign. So what is the Real Mom Revolution campaign you’re probably wondering? Well, it’s all about realizing that we’ve got a lot going on as moms. Do we have perfectly combed hair or clean car all the time? Nope! Not here! Am I wearing the T-shirt I wore yesterday and slept in last night? Yes, I am, and I’m proud of it! Ha! The Real Mom Revolution is just about being honest about who we are and what it takes to be a mom. It doesn’t take perfection. Just love and dedication. Real Mom Revolution is about wearing yesterday’s leggings and bringing store-bought cookies for the bake sale and being proud of it! So LALA and I essentially wants to invite all moms to live the life they want to and do it on your terms. And hopefully LALA can make it a little bit easier by providing a healthy snack for you and your little one that you can easily grab on your way out the door. Running around frantically trying to get Molly out the door to school without having time to give her breakfast is it totally a Real Mom Revolution scenario. So what do I do? I grab a LALA smoothie to go! I honestly have done that countless times and they’ve been a lifesaver for me in many of those on-the-go moments. Anyway guys, I just wanted to share this incredible brand with you and share that the awesome campaign that Molly and I are part of with LALA. If you want to know where you can get them in your area CLICK HERE. And join us in the Real Mom Revolution! Share your stories below of times where you had your “real mom” moment. I wanna hear them all! I’m going to comment on every one of your stories to let you know that I am here and I am listening and I’m right there with you mama! Hi Ali, congrats on the new campaign! There are not too many options for a smoothie yogurt for kids and my kids gets bored from the ones I buy so fast , and I needed a new alternative. Hope they will sell it in Safeway/Target too.. I don’t know how you get Molly to sit so nicely for the pics, you all look adorable! Thank you so much! We can’t wait to see it go up in Walmart next month!!! You and your kids will LOVE this brand! I gave some to my friend and her husband and they are obsessed! Really! Where are the deets on all the adorable clothes you are wearing in these pics?! This is my cardigan: http://bit.ly/2Uxr9Lu I will looks for links to other stuff too! Congratulations on the campaign! I’m sure they are delicious. Side note : can you please tell me where you bought that lilac knit sweater!! It’s so feminine and beautiful. Love love love the colour. Thank you!!!! We are so excited about it! We loved seeing them in Indiana! So cool can’t wait to see you 2 adorable ladies in my store. 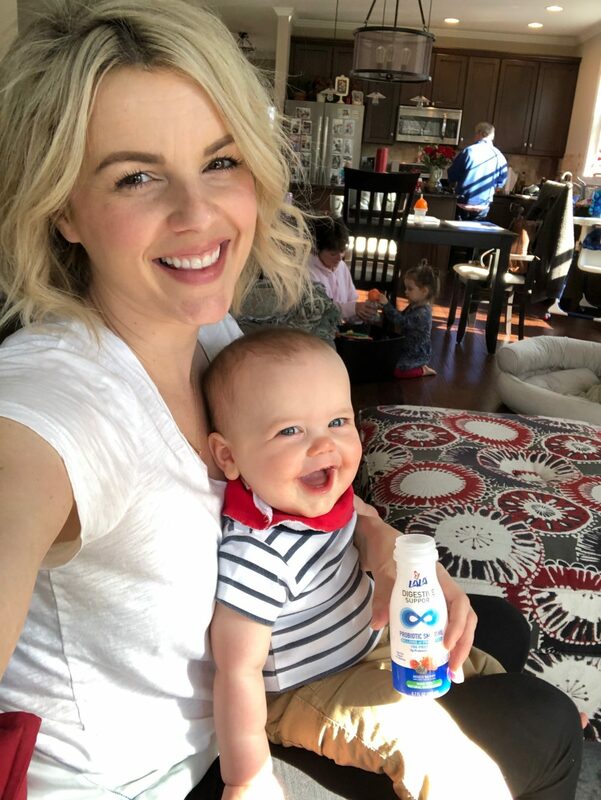 Everyday is a mom moment lol So happy to hear about a great product for my kids as well as a campaign that keeps it real. It’s the perfect combo for you because that is what I love about you the most is uoubkeep it real. Congrats! If you see it in your store snap a pic and send it to me!!!!! Months back you posted something about LALA and I searched every grocery store in my area looking for them. Can’t wait to see you and molly smiling At me in Walmart! Oh than you sooo much Megan! I appreciate you saying that! Please let me know if you see us in your store and tell me what you think of LALA! You’ll love it! These look super yummy. Congrats on the campaign. I’ll keep my eyes peeled for you guys in April at Walmart. I’m going to give these a try! Make sure to take a selfie and tag you! At first I thought u were coming on tour with the company and I was super excited but this will work too! Can’t wait! Yes please do!!! Can’t wait to see your selfie! Could you please share a link to your pink hoodie that you were wearing in your instastories? Muah! I think it’s by Dan skin. This blog has become one continuous Ad after another. There is no substance anymore. You once said that your dream job was being a moderator on a panel discussing women’s issues. I realize that that may open you up to conflicting opinions and that has been a problem for you in the past, but at least it would start a conversation and be more interesting than potty – training and a Bachelor recap. I realize that your main audience is Mom’s with young kids at home, but you might want to expand your horizon a little. Sorry you feel that way Cindy! It is my highest priority to keep my blog authentic and real! This campaign is something I am soooo excited about and it’s not an ad in my mind. It about a wonderful opportunity that I got to do something fun with my daughter and talk about a product I truly love and inspire other moms along the way. And I am a mom with 2 kids two and under. This blog is a platform for me to share my experiences. And right now – that’s potty training and the bachelor. That said, thank you for reminding me that I want to talk more about Women’s issues and not JUST mom issues. I will try to incorporate that more! Ali, you are so gracious! Most of us read your blog because we truly enjoy the upbeat cheerfulness you share. Posting regularly is so hard! But it’s rewarding and fun, and I champion you for taking the time, and choosing to brighten others’ days by speaking to us like you’d speak to a friend. Whether it’s a smoothie or a sweater, it’s fun to see what you like! Just like it would be to share this information with a friend. Thanks for putting so much positive energy into the world. Your blog is a pretty, happy place on the internet, and that’s something special. You are appreciated! Hey, no judgement just feel obligated to let you know…. one of these bottles containes about half the recommended allowable added sugars for a child Molly’s age. 😬 it’s not that I wouldn’t give it to my child but I’d treat it more like a dessert than a health food. Congrats, Ali! I cannot wait to try LALA smoothies with my granddaughters, ages almost 3 and 1 1/2. It is a challenge with food most days, especially the oldest. She loves yogurt and smoothies so this is a win-win. I’m so excited to learn about these. It sounds like the perfect solution for my husband, 11 month old son, and me! We have been searching for some quick, easy, healthy options lately. Can’t wait to pick some up and try it! I really think your “platform” is to get as many free items as you can. Every item you post is an ad, from the Loopy phone cases to the vanity planet Mirror to the Lala yogurt. It seems like all of your opportunities are “what’s in it for me?”. Most of what you blog about is not authentic and real. That said, most of us don’t give two craps about potty training. I love this new campaign and want to give these a try! A quick healthy breakfast is important to me and yes, there are those mornings where there is no time except to grab something. And I have grandsons who spend the night sometimes and I would love to give them these! Ali, thank you for taking the time to research your products and looking out for all of us. It definitely helps to know what is good to buy, especially for the little ones in our lives. Will check out your faces next time I’m at Walmart! Are the smoothies sold at Walmart in Canada? 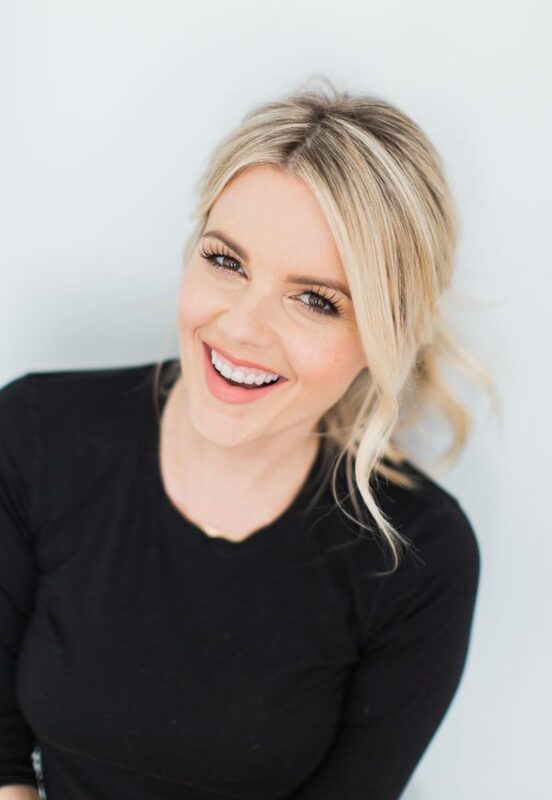 Thanks for posting about LALA and their real mom campaign! You are my real mom inspiration everyday. Thank you!! Looking forward to having my daughter try the smoothies.